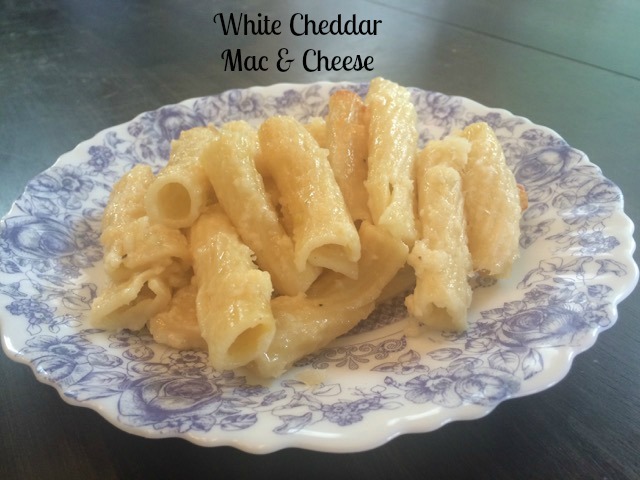 White cheddar mac & cheese is a twist on tradition with large tubular pasta and a rich, decadent sauce made with aged white cheddar. This white cheddar msc & cheese is a yummy, kicked up a notch cheesy pasta that it huge on flavor. My sister-in-law made this for a family dinner, and I couldn’t wait to get the recipe. The sharp aged white cheddar is key to the rich, tangy cheese sauce. Resist the urge to buy anything pre-grated; it won’t yield the same result. Also, don’t be hesitant to use full fat (or at least 2% fat) cottage cheese. The more fat, the more flavor in the end. The photo above shows the dish made with penne pasta (pronounced Penn-ay). Penne is a tubular pasta that most often has lines or ridges on the surface that hold heavy sauces. Ziti and rigatoni are similar and would also work well in this recipe. The Cheese: Twyla uses the specialty selected aged reserved white cheddar from Aldi. It comes in a 12-ounce block, and she grates it by hand~emphasizing that pre-grated cheese will NOT turn out the same. For those who don’t shop at Aldi, any high quality sharp white cheddar should work. Make ahead: The recipe can be made a day or two ahead. Simply combine the pasta and all ingredients, mix well, and store in the fridge in a ziploc bag. When ready to cook, simply spread into a baking dish, top with additional cheese, and bake. Super easy! I would love to hear from you if you try this dish, so please leave comments! Thanks so much for stopping by! Be blessed, and stay savvy!!! This is as good as any mac & cheese you'll ever eat, and it only calls for 4 ingredients. In salted water, boil pasta until al dente~12 minutes. Add cottage cheese, sour cream, and 8-oz white cheddar. Stir until all cheese is melted and mixture is smooth. Store mixture in a sealed bag in the fridge until ready to bake. Spread mixture in a greased baking dish. Top with additional 2-oz white cheddar. Bake at 350 degrees until bubbly and edges of pasta beginning to brown.